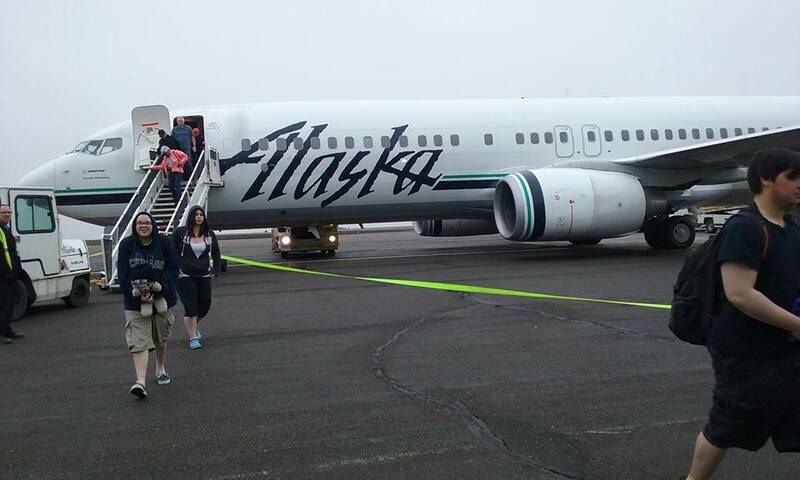 June 26 – Arrived in Anchorage about 3:30 am. Very tired after very little sleep. The students have been great sports about life in transit! Nestled in the mountains of southern Alaska, we spent the next three and a half hours watching Anchorage Airport come to life. Breakfast, shops opening, napping, reading, etc. We met up with Flora Hank and her newborn who were going to be on the same flight to Barrow. She was heading home to Point Lay. 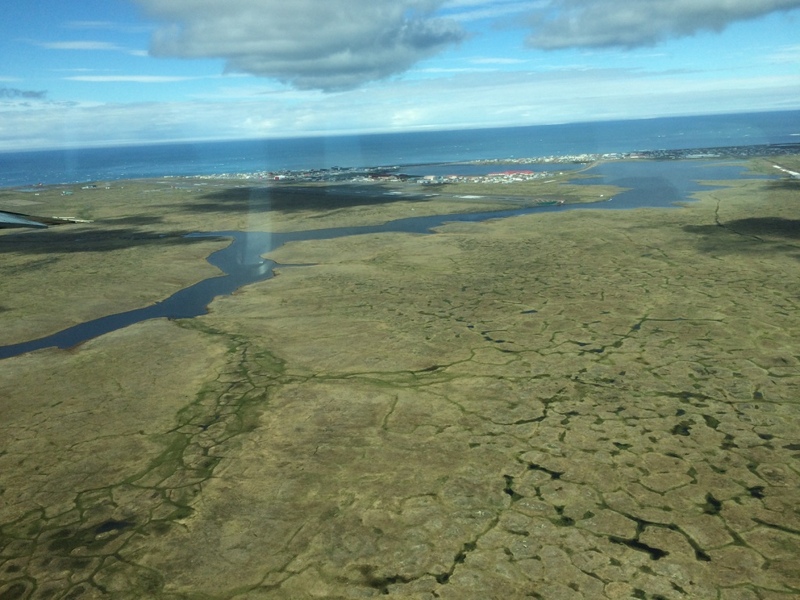 After a brief layover in Prudhoe Bay (yes, we flew over the Alaska Pipeline! ), we arrived in Barrow at 10:45am. 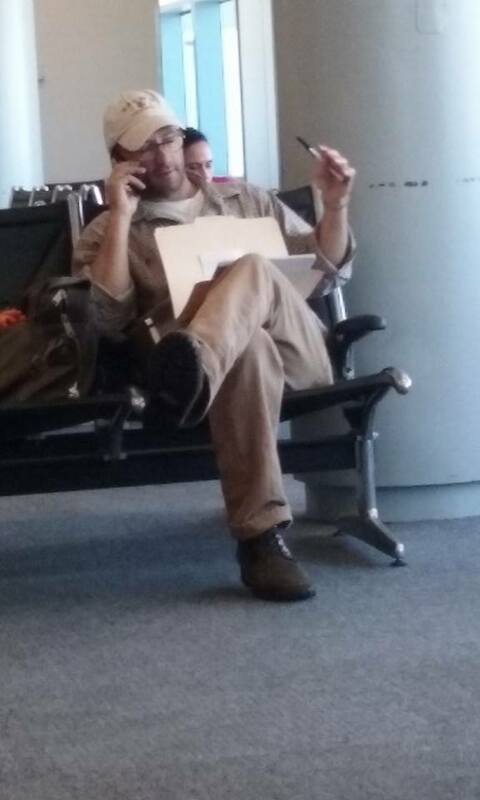 Crissy catching a pic of Jason on the phone clearing up the flight plan to get us to Alaska. Finally arrived in Barrow. Anthony is very happy about that! 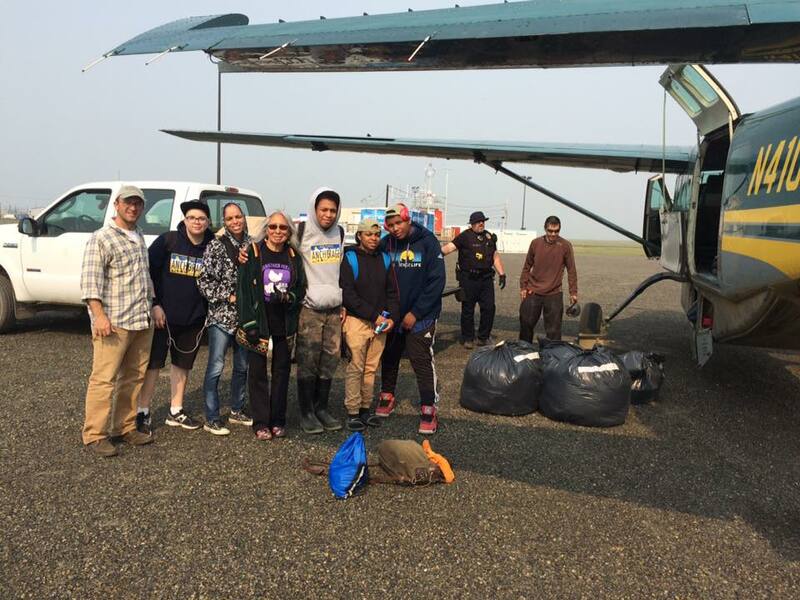 Our friend Leslie Pierce, from the North Slope Borough Department of Wildlife Management, picked us up and brought us to the Arctic Research Facility (ARF) where we dropped our gear, settled into our rooms, and bundled up for Nalukataq. Nalukataq is a whaling thanksgiving, like an Arctic potlatch or give-away ceremony, where successful whaling crews distribute the bounty of their hunt along with other treats like tuttu (caribou) soup, nigliq (white-fronted goose) soup, fresh fruit, mikiaq (fermented whale meat and blood), uuruk (cooked whale meat), and maktak (whale skin and blubber). 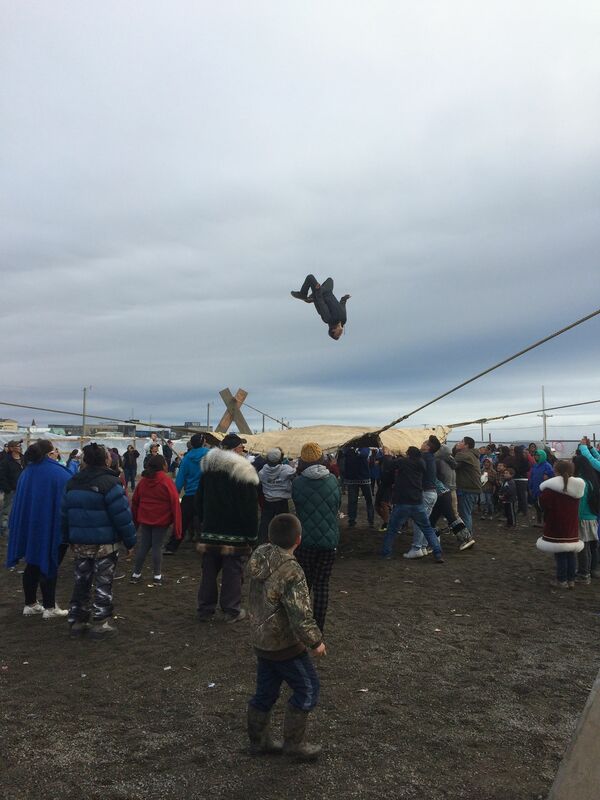 Nalukataq began at about noon and takes place in a semi-sheltered space about the size of a hockey rink. Today’s event was hosted by two whaling crews, Capt. Eugene Brower’s Aalaak crew and Capt. 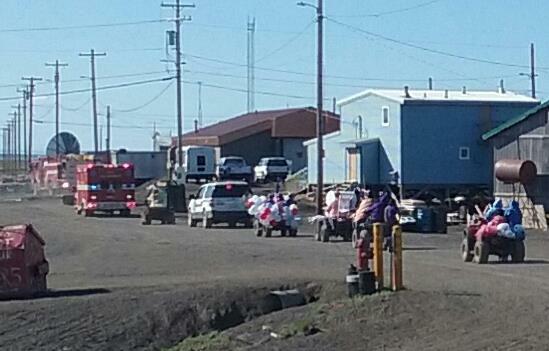 Gordon Brower’s Ikayuaq crew. 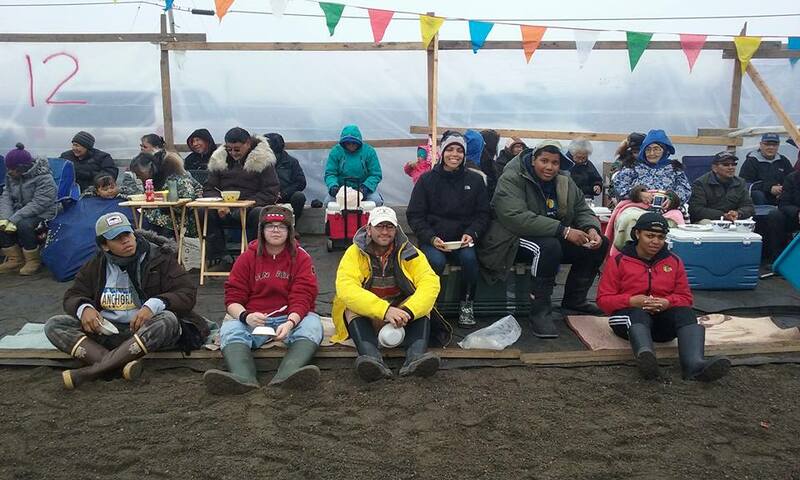 We sat in section 12; sections are numbered around the enclosed space to allow the event hosts to direct their crews to make sure that all attendees in all areas are provided for equally (though elder’s are gifted first with some things like akutaq (Eskimo ice cream)). It was cold, and misty to light rain, so we warmed up by walking around and met Inupiat community members including Mayor Charlotte Brower, State Rep. Benny Nageak, and members of the village corporations. 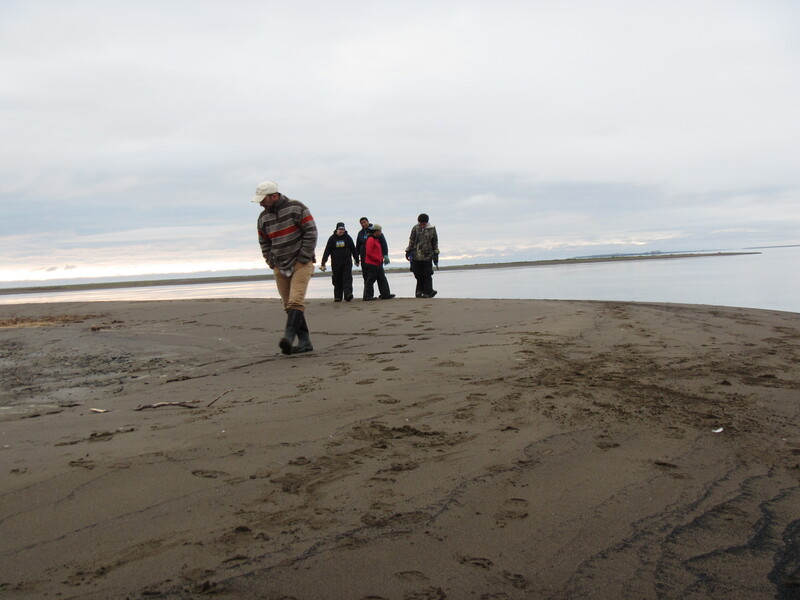 We checked out the beach area and sea ice near the old Cape Smythe Whaling Station. After the distribution ended, we took our cooler full of whale meat back to the ARF and repackaged it for transport to Connecticut. 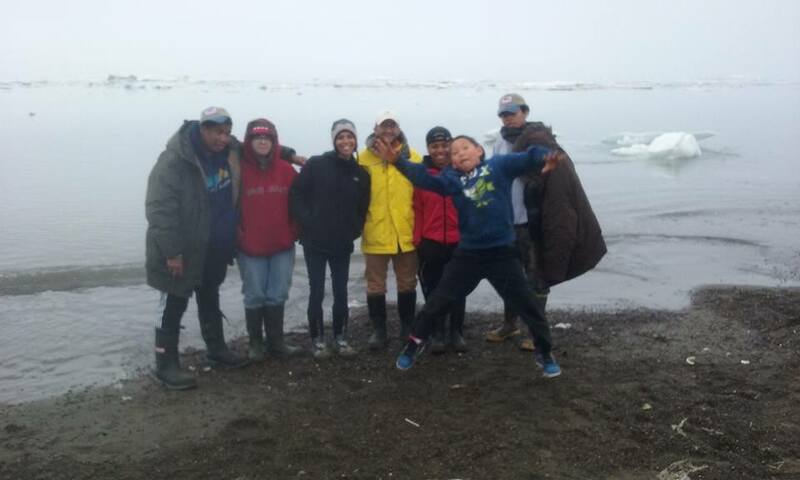 Nalukataq, Section 12. l-r: D’Vante, Anthony, Jason, Crissy, C.J., Aakyia. Waiting for tuttu (caribou) soup. 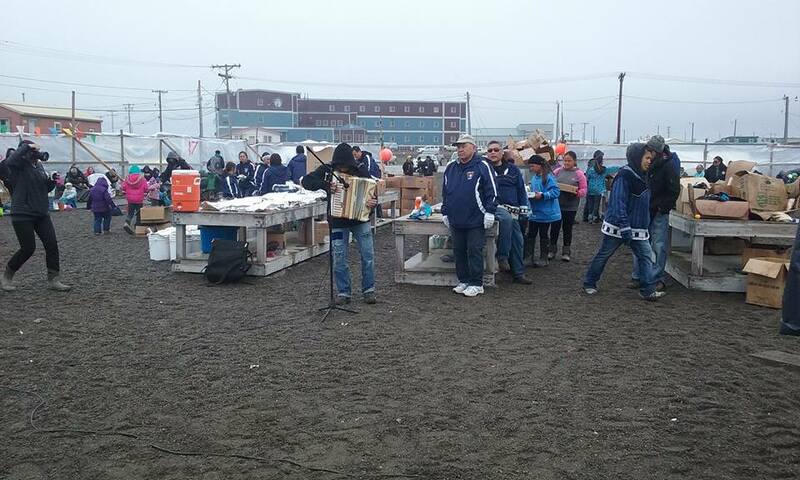 At Nalukataq: Brower crews distribution tables along with some accordion music. 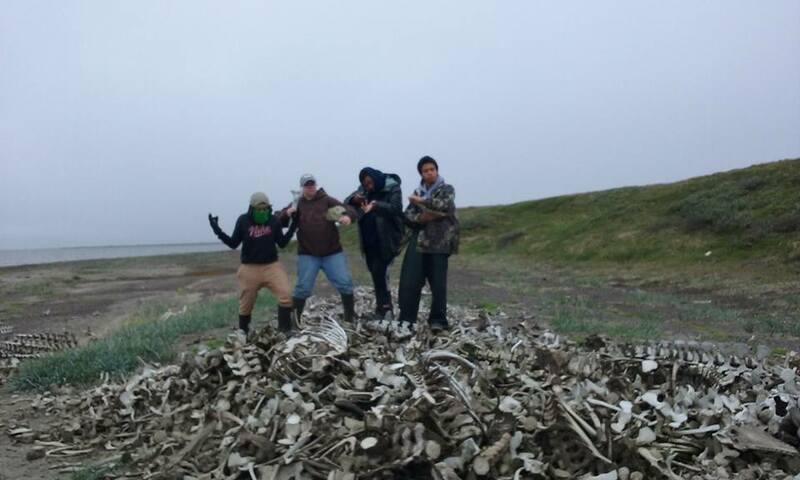 At Nalukataq: Aakyia showing D’Vante and Anthony how to flense a whale tail. At Nalukataq: Aakyia helping Inupiat elder, May, to cut pieces from a bowhead whale fluke. Pequots standing in on ice in the Arctic Ocean. Pondering ways to avoid doing a polar plunge. 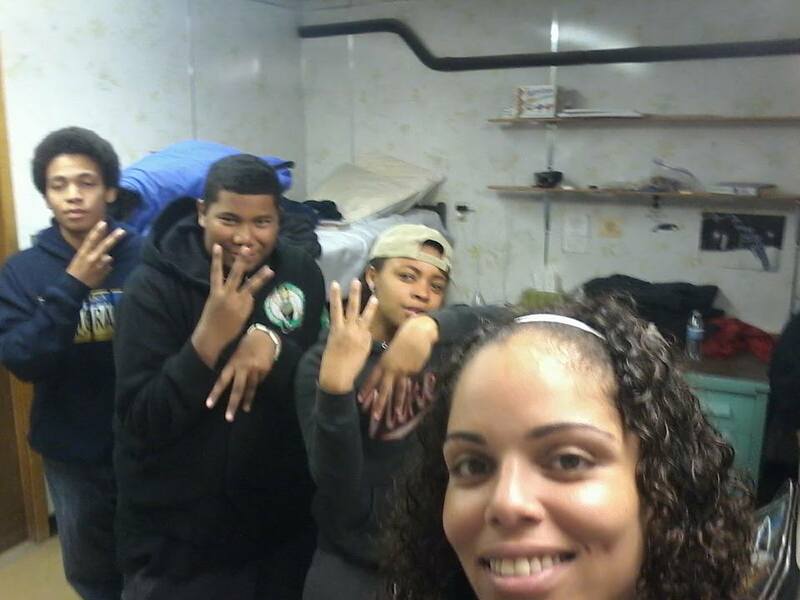 l-r: Anthony, C.J., D’Vante, Aakyia. Fog rolling in. Sea ice moving out! Leslie and Jason on break from Nalukataq. 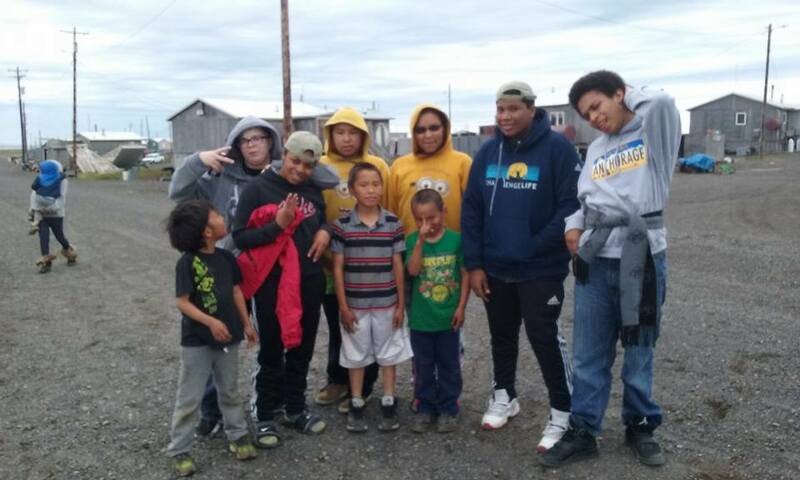 Group shot and photobombed by and anonymous Inupiat kid. l-r: C.J., Anthony, Crissy, Jason, Aakyia, anonymous, and D’Vante. Under the bowhead whale jawbone arch at Old Cape Smythe whaling station, Barrow, Alaska! June 27 – Up early to write and catch up on emails. Headed to Ilisagvik College, just a short walk away from the ARF. Eventually, Crissy and the kids joined me. Leslie picked us up and, after a quick stop to see a local sled dog team, dropped us at the Inupiat Heritage Center (IHC). 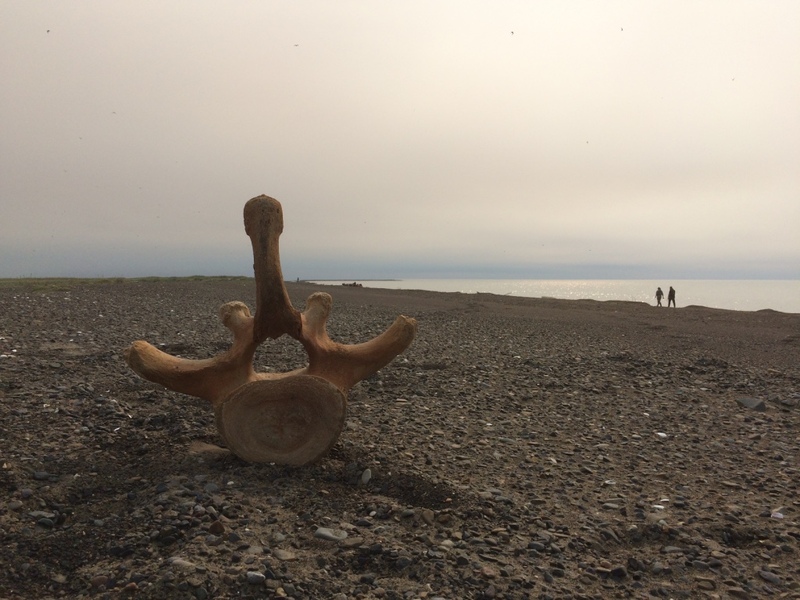 We wanted to look for some gifts and the traditional artist’s room at IHC has always been a great place to connect with Inupiat artists who work with whalebone, baleen, walrus ivory, and mammoth tusk. I bought a whalebone-handled ulu; ulu’s are part of everyone’s tool set here and extremely useful for cutting and butchering. 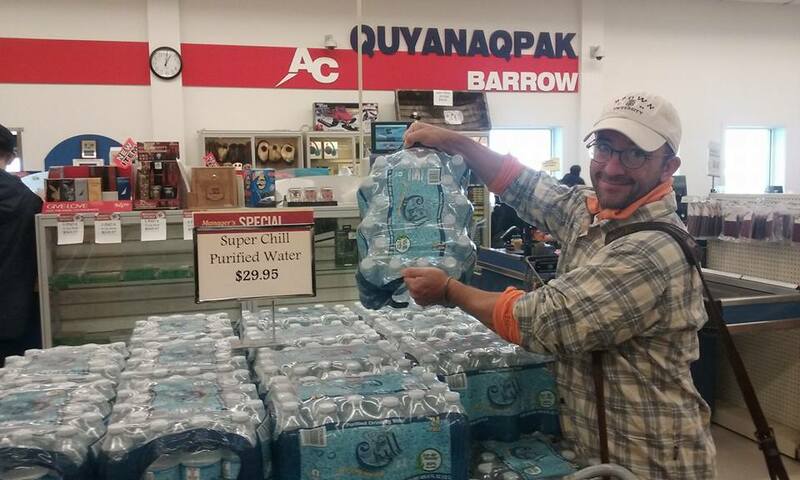 We continued to look for gifts across the street at the AC store, Barrow’s mini-Walmart. Local Inupiat folks sell their wares in the lobby and we had the pleasure to meet Earl Aiken. Earl etches small pieces of baleen with scenes from the “Land of the Midnight Sun” and sells them as souvenirs. I bought two. The kids are still looking for gifts, but we have friends in Point Lay who make lots of things. 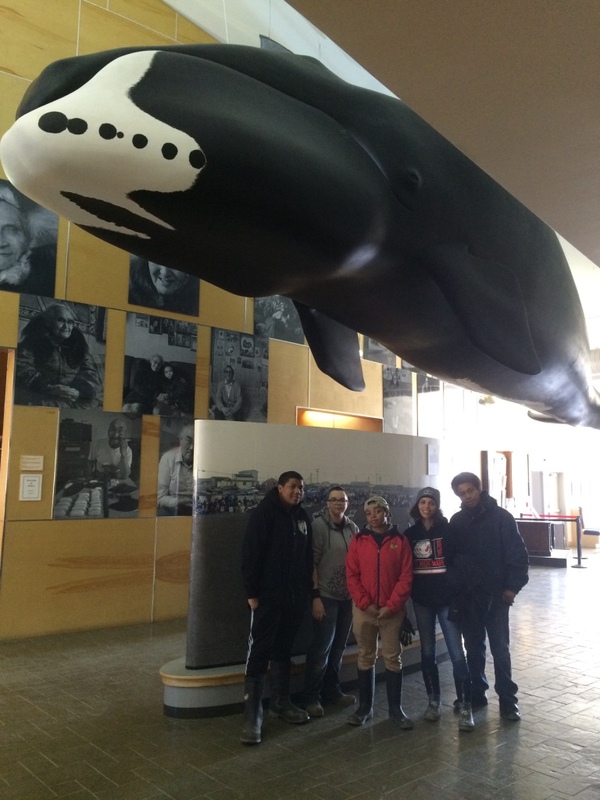 After the AC, we returned to the IHC to check out the whaling exhibit and to learn about Inupiat life and traditions. This exhibit is one of my favorites and had a new gallery featuring a journal recording the oral history and art of a mammoth hunt. 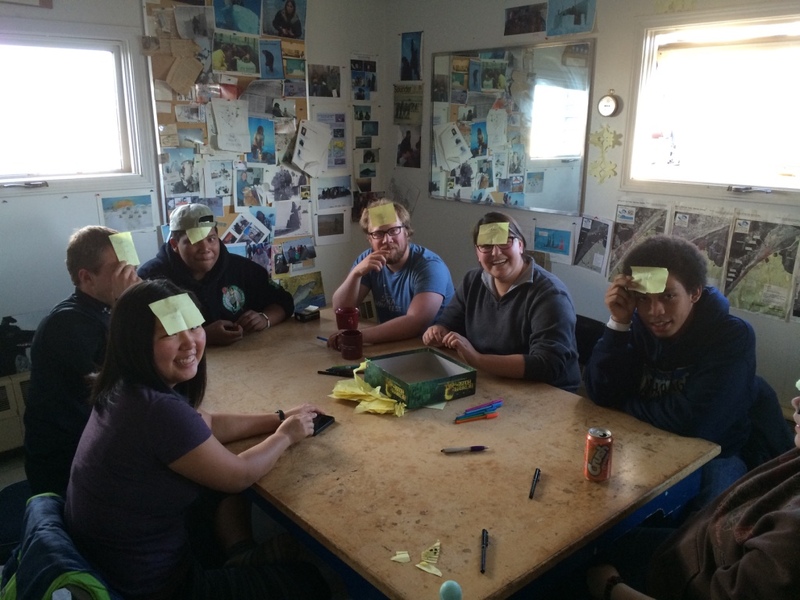 Three up/three down – WM – Wildlife Management students in the Arctic Research Facility. l-r: D’Vante, C.J. Aakyia, and Crissy (chaperone). 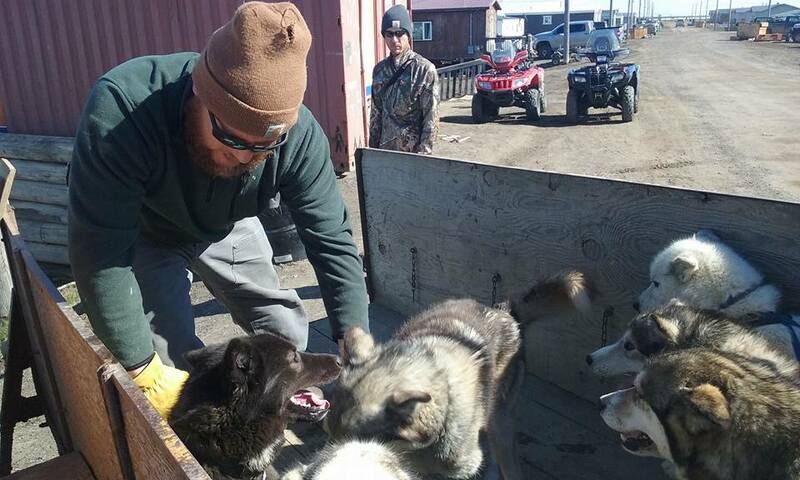 Quick stop to visit sled dogs who were on their way to the beach to get a much needed workout. 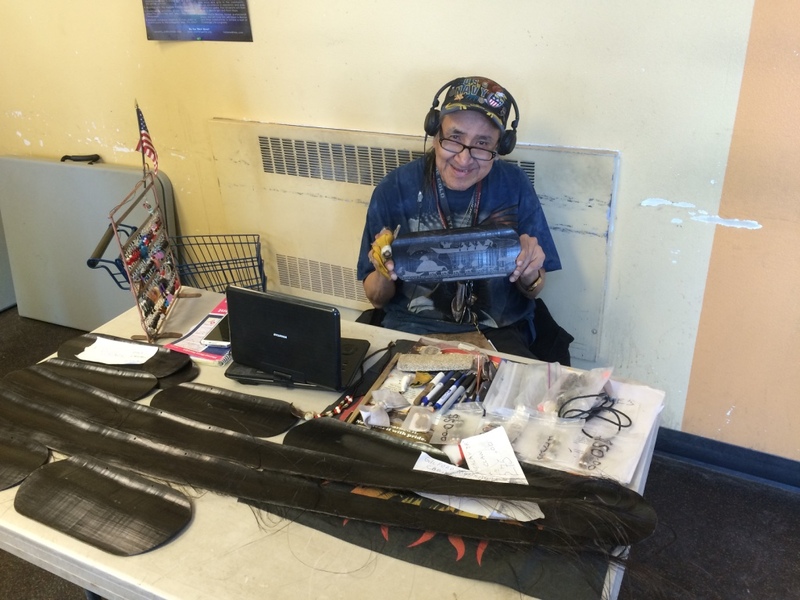 Inupiat artist, Earl Aiken, in the lobby of the AC etching scenes of arctic life into baleen. Sticker shock at the AC store in Barrow! Touring exhibits at the Inupiat Heritage Center. Standing under a replica of a medium sized (35 foot) bowhead whale. l-r: C.J., Anthony, Aakyia, Crissy, D’Vante. 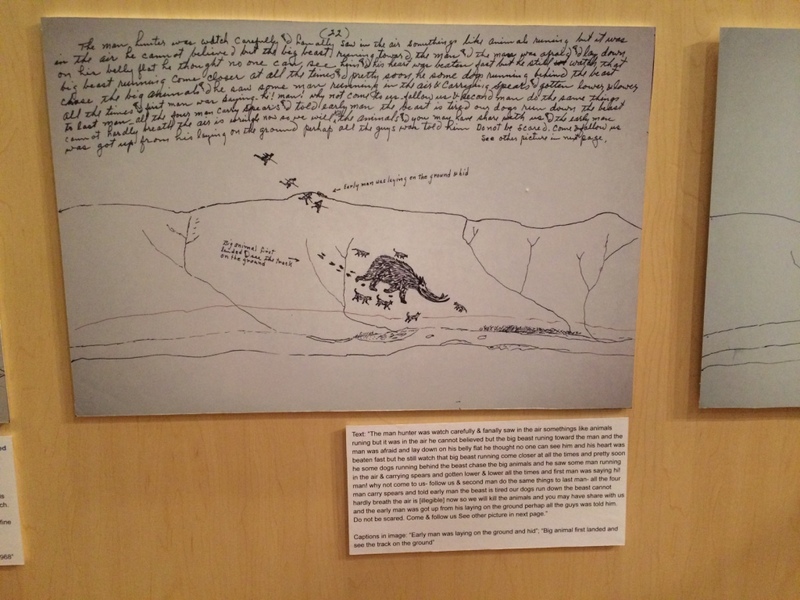 Part of a new exhibit at IHC about an oral history of a mammoth hunt. Leslie returned from shuttling Robert, Greg, and Tracy to the airport. They were heading to Point Lay ahead of us to set up the zodiacs, and to complete plans for our arrival tomorrow. We returned to the ARF to prepare for an afternoon outing to Point Barrow, the farthest point north in the continental USA. 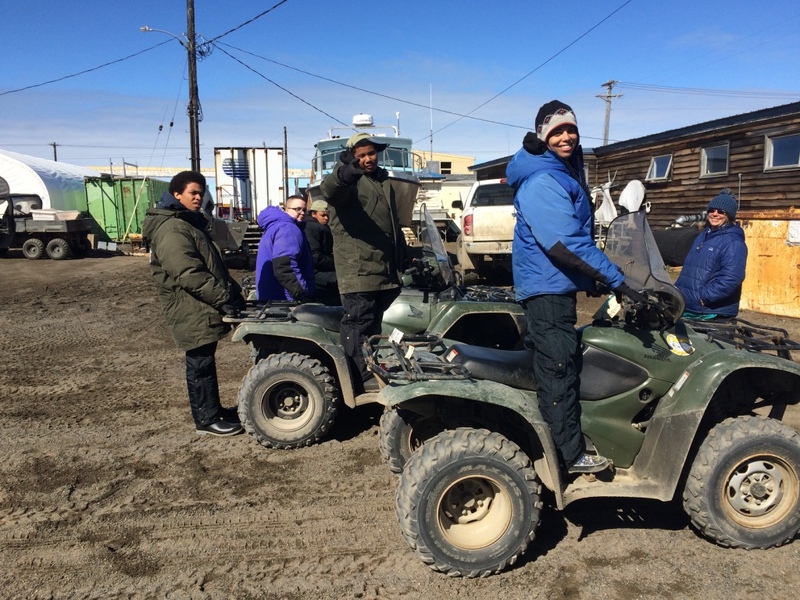 We paired up on ATVs and made the five-mile trip stopping along the way to check out sea ice that had piled up along the beach, learned about the “frozen family” who have been crushed and preserved by this type of event about 500 years ago. We continued along the way and met some locals who were going to check their fishing net. 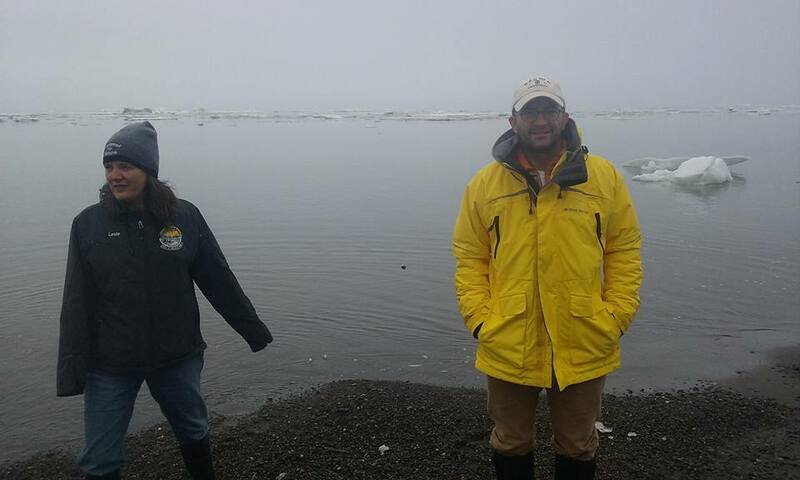 We took pictures at Point Barrow where the Chukchi and Beaufort Seas meet. 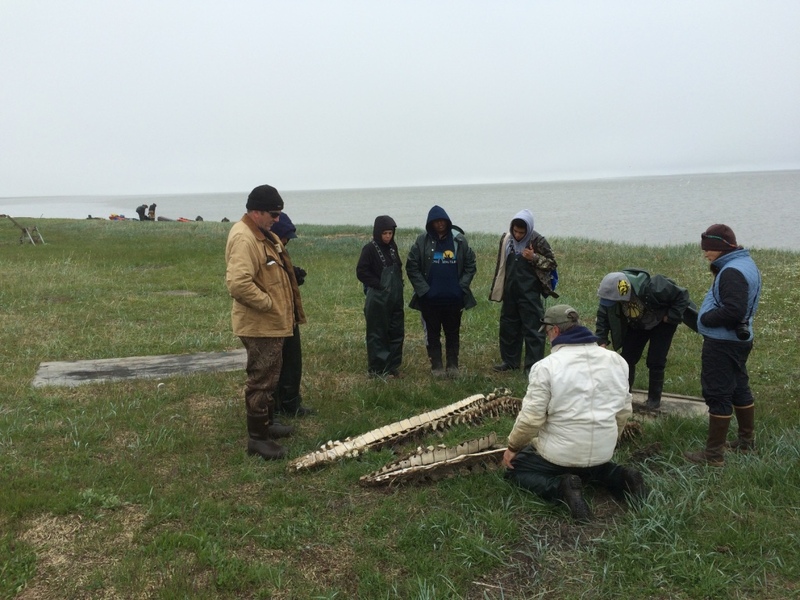 We followed our companions to Elson Lagoon to check their net. The net was stretched perpendicular to the beach like a moveable fish weir. It was on a loop like a clothesline, easy to pull in and send back out. No fish, but saw lots of krill-like species on the beach. This is whale food! We did see lots of whale bones on the beach, evidence of earlier hunts took took place. We headed back and saw some small cemeteries from the 1917 influenza epidemic, the wood “head stones” still legible! We were also looking for polar bear tracks but did not find any. We stopped at a tropical place at the fishing village of Pigniq; it had palm trees made from driftwood and baleen. Once back at the ARF, we rested for an hour before heading out to dinner at the Top of the World Hotel. Craig George and Cyd Hanns, from the Department of Wildlife Management joined us as well as Taktuk, a grandson of Sadie Brower Neakok, the late Inupiat elder who shared a magnificent oral history of Inupiat life in the 1980s. To round out the evening, we did our shopping at the AC – wowed by the astonishingly high prices – and left with a $480 bill for a cart of food. Returned home about 9pm, to shower and prepare for Point Lay. I headed to bed; Crissy and kids stayed up and played the game “heads up” with other ARF residents, Nathan, Callie, and Sam. Outside: the Inupiat Heritage Center. Inside: the skull of a bowhead whale. Crissy “Polar Bear Bait” Gray can’t wait to go to the top of the world! Outside the ARF gearing up for a visit to Point Barrow. D’Vante, Anthony, Aakyia, and C.J. all geared up. 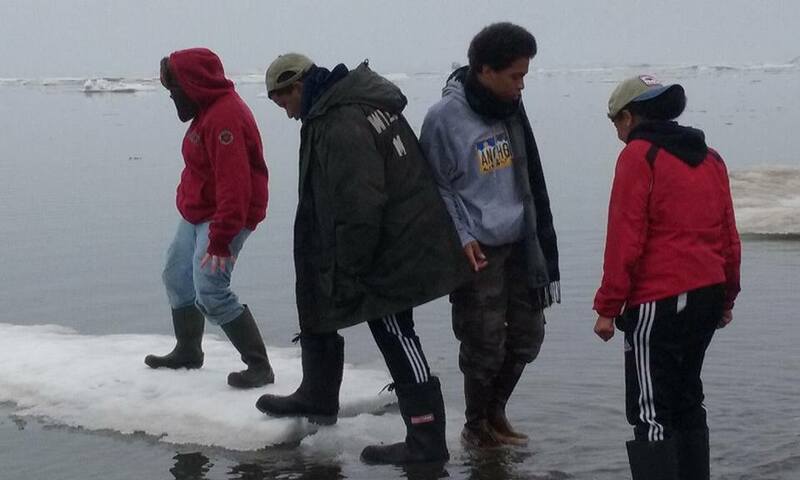 Pequot students exploring some sea ice on the beach. Learning about Barrow’s “frozen family,” birdwatching, looking for whales, and watching shifting ice in the Chukchi Sea. Checking a fishing net in Elson Lagoon. 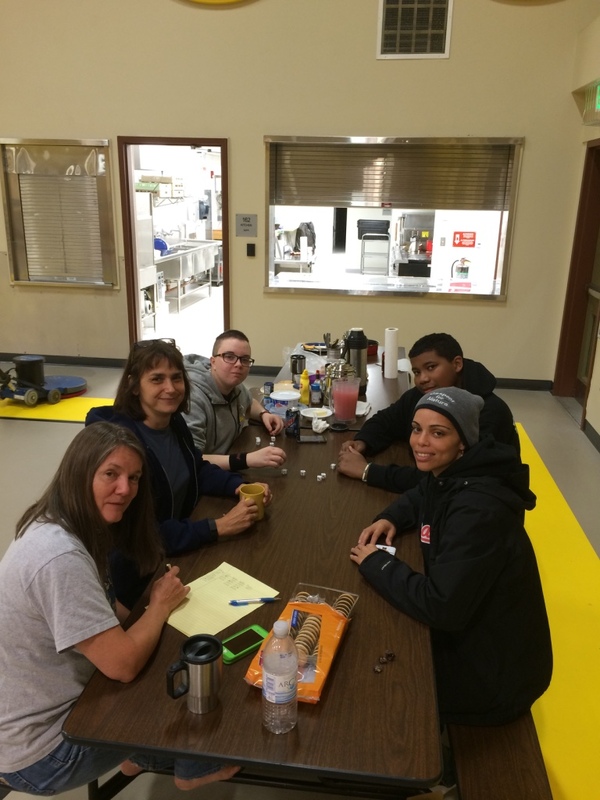 Playing “head’s up” in the ARF kitchen. June 28 – Sunday. Packed our gear, boxed our food, cleaned and swept the ARF by 10:30 in preparation our trip to Point Lay (Kali). We checked in at the airport which took a while because seven of us (including Leslie) were carrying lots of gear and food. Because of delays, we had a little extra time to go to the AC and have breakfast and get some last minute items. 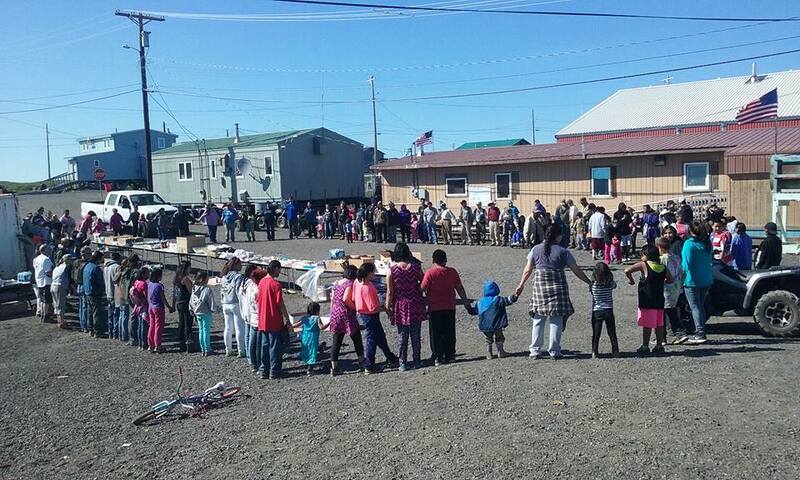 By 2pm, we were boarding our flight and bound for the Inupiat Village of Point Lay, population about 250. Once we landed, we settled in at our new accommodations in the classrooms at Kali School. After a brief orientation and learning some rules of the road, Crissy and the kids went to see Marjorie Long and her family. The rest of us relaxed a bit. Later, Robert, Leslie, and I spent time in the kitchen making dinner – spaghetti and meat sauce. Hopping on a puddle hopper from Barrow to Point Lay! 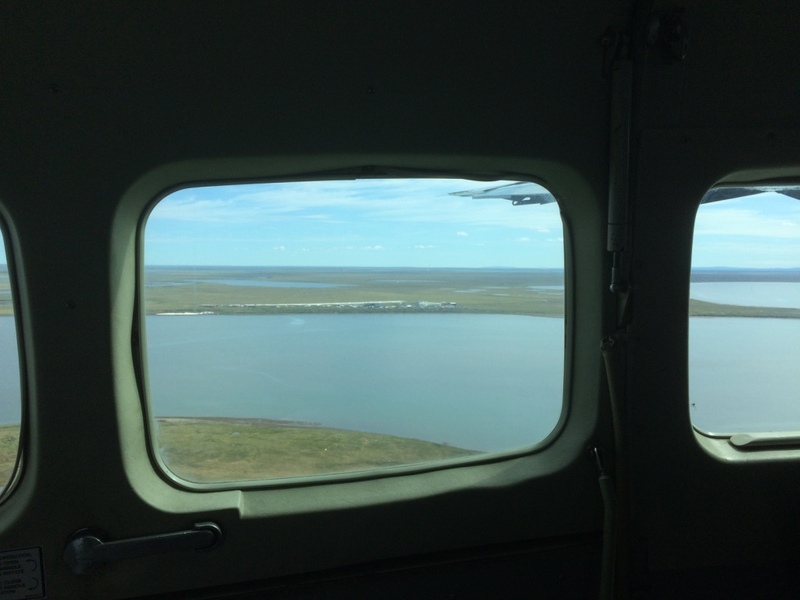 Departing Barrow – tundra, village, Chukchi sea. First time on a puddle jumper! A picture framed view of Point Lay (Kali) from our plane. Greeted by the kids of Point Lay. June 29 – Blustery day and mid-40’s. 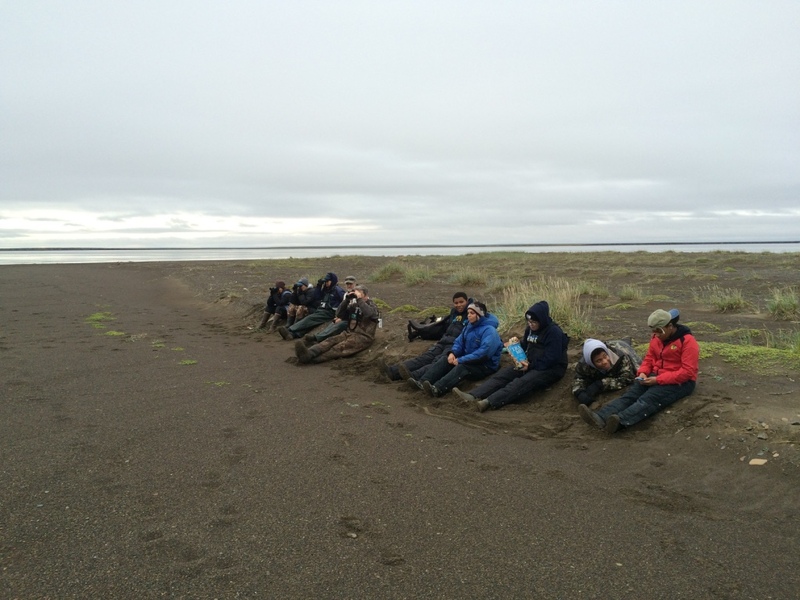 Slow start and waiting for word if we would head across the lagoon to conduct some sampling of the 50 or so beluga whales that were harvested by the community on June 21st. Still choppy on the water, so we had breakfast, relaxed for a while and played a dice game called farcle, and then went for a walk. Some of the village kids followed us and we eventually ran into Robert Lisbourne. Robert showed us the mammoth tusk he found in the tundra last year and then we asked if we could see his father’s ice cellar. His dad, Julius Rexford, is one of the village whaling captains and the ice cellar are used to store larger shares of whale meat and maktak. The cellar was dug into the permafrost at a depth of about ten feet by using large augers. The lower five feet was expanding horizontally by hand chopping so was about eight feet in diameter. Inside the ice cellar there was a leak that had formed a very large icicle, with water pooled below in a plastic tub. We helped Robert haul out the ice and water by using a 5 gallon bucket with a handle tied to a rope. After visiting Robert, we headed to the boat launch and back to Kali school for lunch. Heard that we would hold off on our visit to the barrier island until the winds died down so we relaxed for a while. I took a nap and nearly missed dinner. 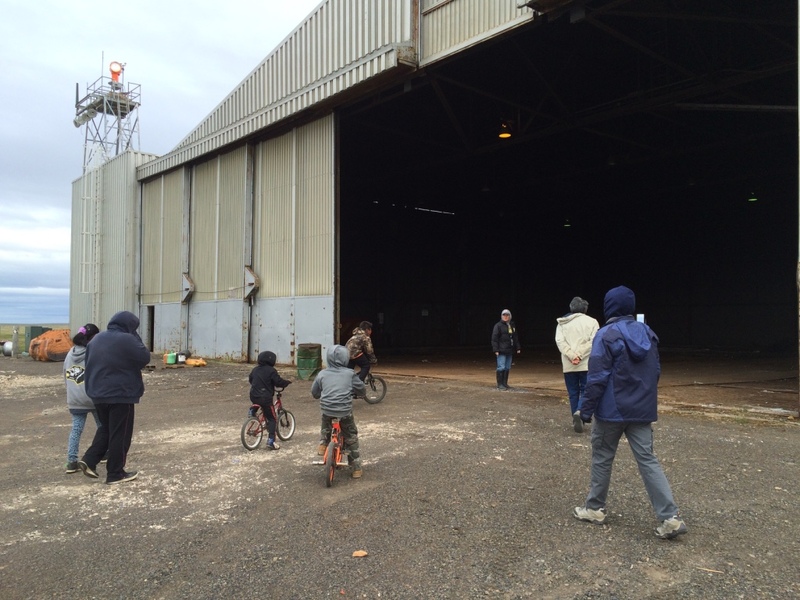 After dinner, some of us went for a walk to the old Air Force hangar and “raven tower” where the ravens nest. Willard Neakok, Leslie Stalker, and a group of village kids joined us. We chatted along the way, threw and/or were hit with snowballs, and went beach combing. Along the beach we found a dead beluga and took a sample for genetic testing. The boys were throwing rocks in the pools of water, finding bird’s nests, and racing off on their bikes. 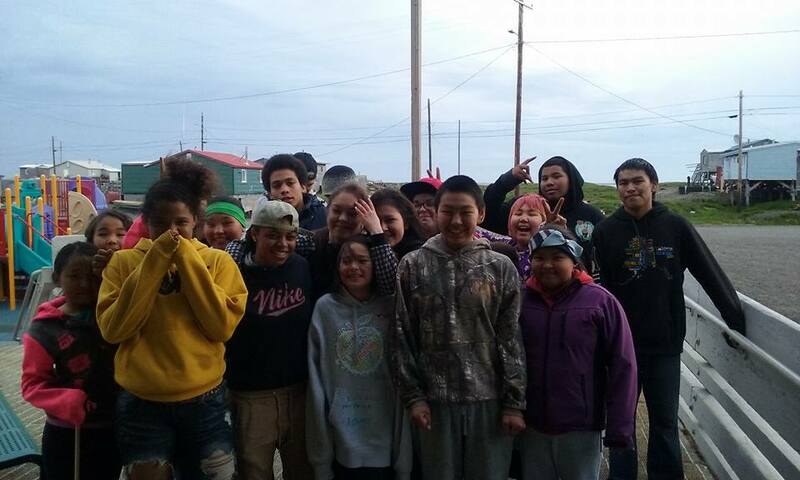 When we got back the the school, we continued a rousing game of farcle and the Pequot students had finally connected up with their Kalimiut counterparts for the cultural exchange. As I close out this entry at 1am, they are all outside playing basketball. An arctic tundra discovery! 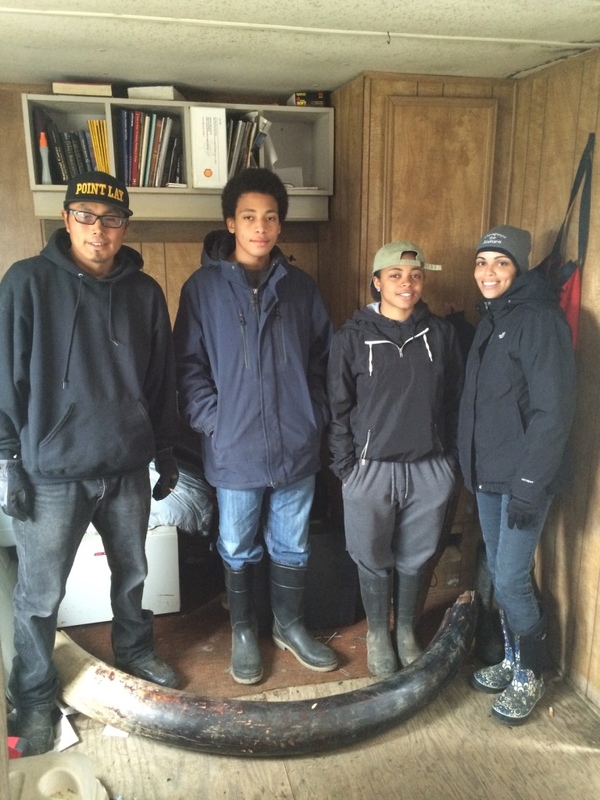 Robert Lisbourne, D’Vante, Aakyia, and Crissy with a fossilized mammoth tusk that Robert found last year. Robert Lisbourne chopping at a large icicle in the ice cellar. Inside Julius Rexford’s ice cellar with stored beluga and bowhead whale from recent harvests. 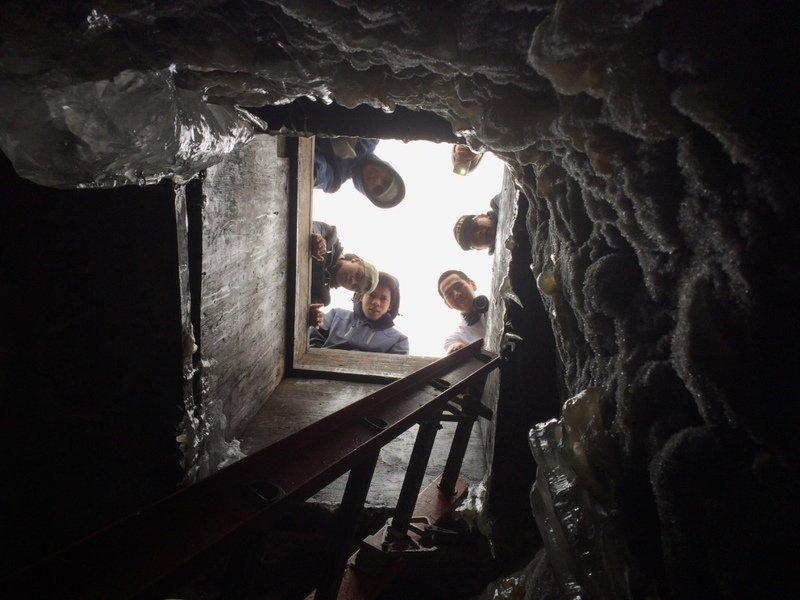 Robert, Crissy, Burton, D’Vante and others looking down at Jason in the ice cellar. Late evening stroll to the old Air Force hangar (DEW line) and raven tower. 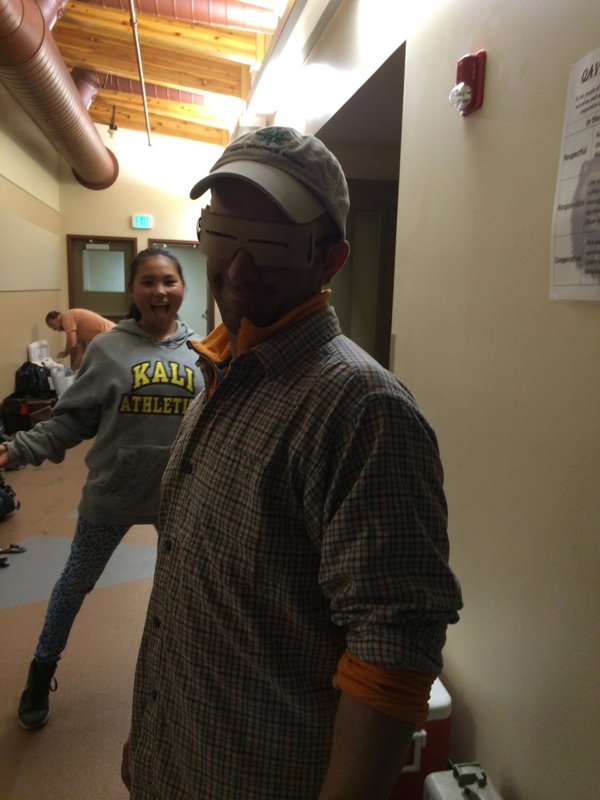 Jason trying on a pair of Inupiat snow goggles and photo-bombed by Terry Ferreira. Nick Hank brought some beluga maktaaq goodness for a midnight snack! June 30 – Woke up to a pancake and sausage breakfast. Crissy and students slept in as they have adjusted to the Point Lay schedule and had been spending lots of time with friends in the village. That is, because of 24 hours of light, many people wake up much later in the day. We start to see the kids playing and visiting at 9pm and they are often out until 2 or 3 am or later. Late in the morning another scientist, Donna, had a arrived. She is a doctoral student interested in beluga behavior, especially in relation to climate change. Once everyone was up and had eaten we headed to the boat launch at about 1pm to load up and head across the lagoon. It was cooler, about 40 degrees F and breezy – 15 knot winds, so no mosquitos. 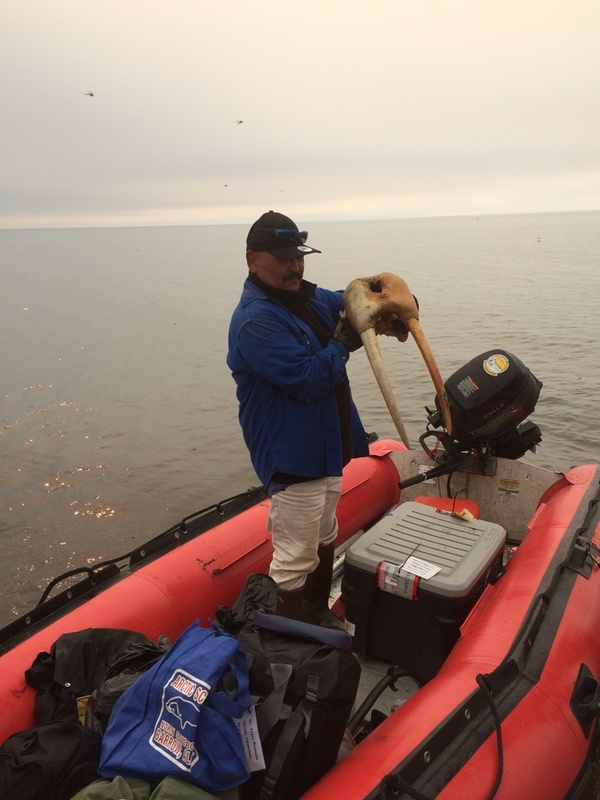 The goal today was to take tissue samples from each of the beluga whales that had been harvested on June 21. This was for genetic testing to help develop a better understanding of the long term population dynamics and behaviors of belugas from this area. The cooler temperatures and wind also kept the smell more manageable. Kyia get a little wet on the way over and the other Pequots were getting cold so Crissy took them for a walk to the old Point Lay village sites to warm up. 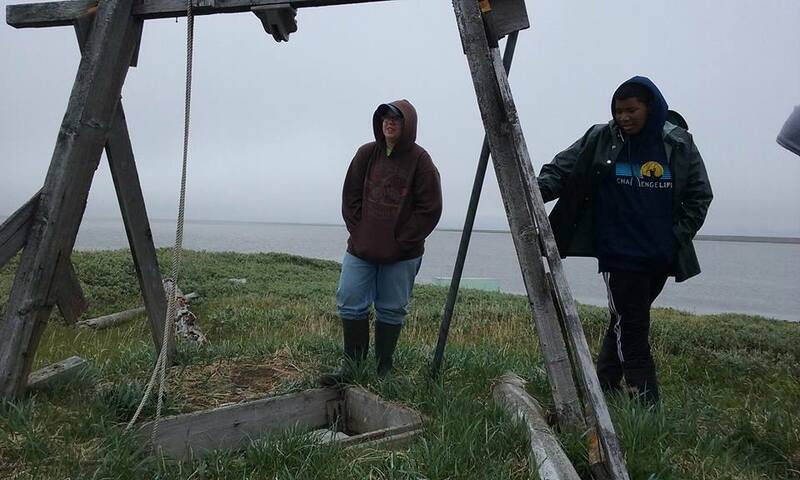 They saw house foundations and abandoned ice cellars, found bear bones, and the beluga bone pile from past year’s harvests. 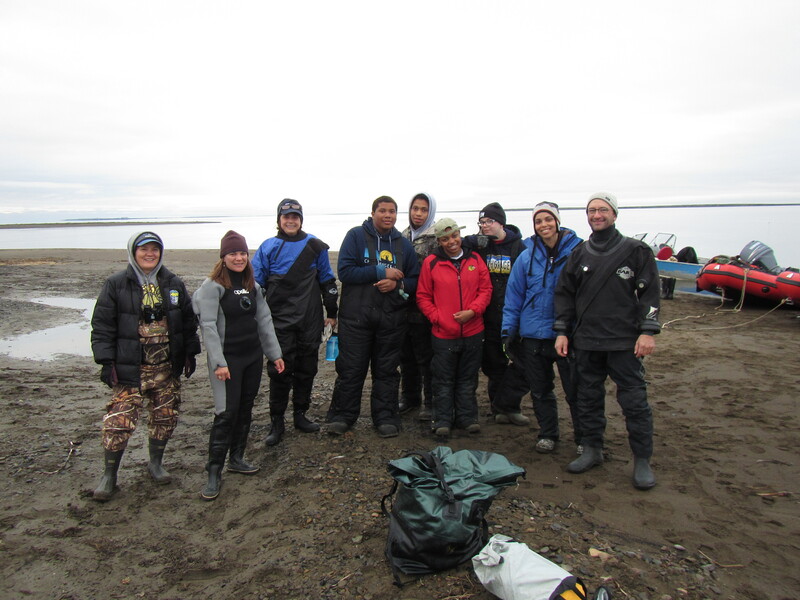 Once we had finished sampling we brought the Pequot back across the lagoon so they could warm up at the school and I went with the science crew to Kali inlet to look for belugas that might be in the area and that might be subjects for tagging. No belugas, but we did some bird watching and beach combing. I was looking for amber on the beach. Towards the end of our time on the barrier island, I found an area with lots of naturally occurring coal. Where there’s coal, there’s often amber. I found a couple of small pieces. FYI – Here’s the link to Bill Hess’ blog about the real story of the Gray Whale Rescue. 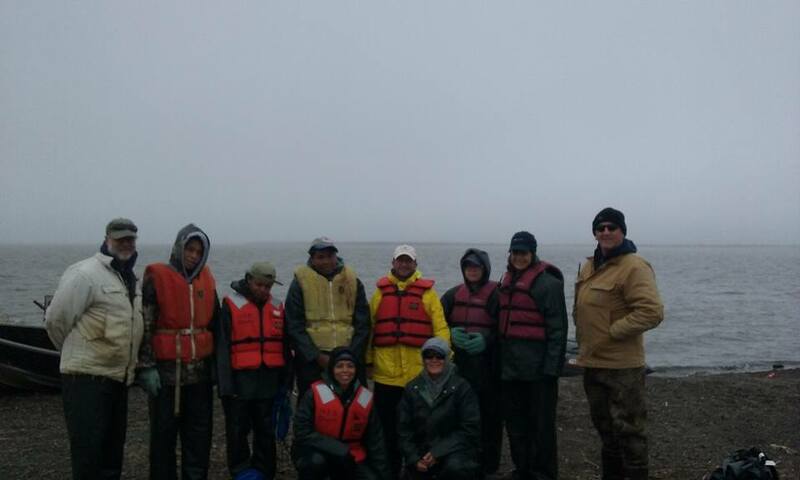 Science crew geared up and headed over to the old village to sample belugas. Anthony and C.J. checking out the remnants of an old ice cellar. The research team looking at vertebral fusion patterns on adult and juvenile beluga skeletons. July 1 – Really windy today. And cool. Suspended our plans to be on the water today. Catching up on work. At noon, we all headed over to the firehouse for Bill Tracy’s retirement party (it was combined with Julius Rexford’s BBQ for cleanup crews). We saw lots of community members and spent some time talking with folks. Jane Pikok and Leo Ferreira (village council president) let me know that they wanted to have a meeting tomorrow night to hear from us about our research proposal. Afterwards Tracy and I met with Robert and Leslie to discuss our research proposal. Dinner was FFY (fend for yourself). I had the maktaaq, rice, and veggies that Nick Hank brought over the other night along with some Irish soda bread that Greg made (he’s Irish). July 2 – Wind beginning to lay down and expected to continue to getting calmer. Relaxed and caught up on work and emails most of the day. Preparing for the village council meeting in the evening. After dinner, we headed over to the community building for the council meeting. About twenty-five people were present. Leo presided over the meeting agenda and an organized and respectful discussion of issues and concerns followed. At every point, it was clear that attendees were interested in knowing how things would be for the benefit of the village. 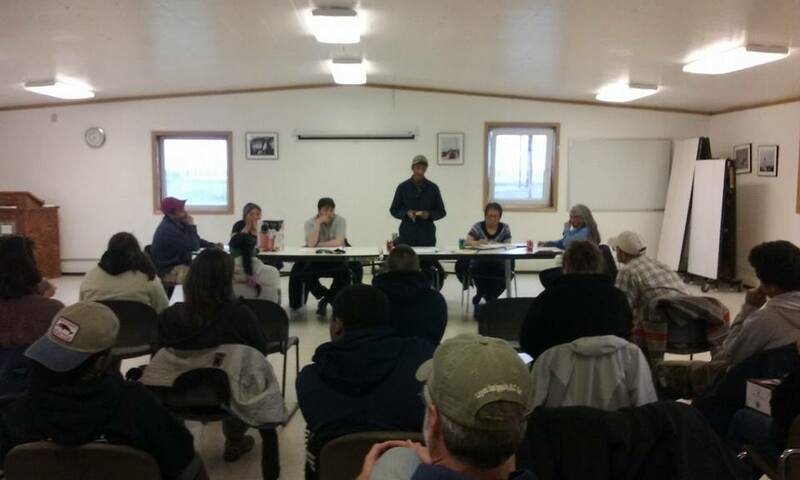 Robert and Greg were able to update the village on research related issues and towards the end of the meeting, I presented information and a plan for research that Tracy Romano and I have relating to the social networks associated the harvest and distribution of beluga meat and maktaaq. The council will deliberate about this later and when they have some more detail from Tracy and I. The meeting adjourned at 9:37pm. We all headed back to the school for a relatively quick dinner and then prepared for a late night on the ocean looking for beluga. We were at the boat launch by 11pm and soon after in the Arctic. We headed across the lagoon to pick up the gear on the barrier island and then through Kali Pass. No beluga. Then south inside the lagoon to 5 Mile Pass and beached the zodiacs. We did spot some belugas and kept an eye on them with binoculars. We radioed to town with hopes to have extra boats help drive beluga into the lagoon for tagging. We waited for about an hour watching and beach combing (i found some more amber). Eventually Patrick arrived and we headed out. Belugas were no longer visible so we headed south and then a drive north to push any that we could not see. Still nothing. On our drive north we did see gray whales – female and calf – at a distance. Headed in at 4:30am and exhausted. Leo Ferreira presiding over the Council meeting. Kali and Mashantucket Pequot students outside the school. Looking for belugas at Five Mile Pass. Dry suits are on and we’re ready to tag beluga! Surveying the horizon for beluga in the Arctic Ocean. l-r: Jason, Tracy, C.J., Donna. July 3 – Up at 10am to the sound of a vacuum. Steven, the school maintenance supervisor, didn’t realize we had been up so late and was cleaning. Needless to say, I got up and made coffee for everyone. Robert and Leslie made pancakes, bacon, and sausage for lunch. Donna, Tracy, and Greg? made sandwiches for our afternoon outing to look for belugas. Crissy and the students decided to stay in the village to meet up with the Kali students and help to prepare for the festivities tomorrow. We went to the boat launch at about 3pm and prepared the boats. Robert and Leslie were in one zodiac, Greg, Donna, and Tracy in another, and Jim Jim Tazruk and I in the third. Robert Lisbourne, Genebyrd Tuckfield, Iqsi Lane, and Cyrus Nukapigak took their boat. We first headed across the lagoon to Kali Inlet beach to pick up the gear we left there the night before and to check for any beluga activities. 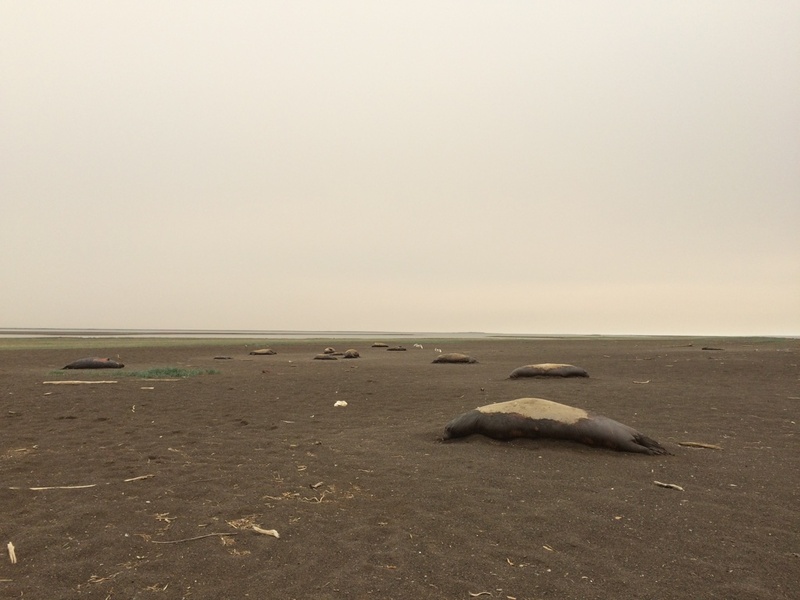 Saw a dead juvenile male walrus, but no beluga. Headed south on the ocean side to Five Mile Inlet to check. The other boats stayed about half a mile off while Jim Jim and I went in the pass to check for beluga. Still none, but we saw Leo Ferreira and his family. We stopped to check in and Lena, Leo’s wife, asked for a ride in the zodiac – she had never been in one. I took her for a quick spin in the lagoon and then Jim Jim and I were off heading south about 15 miles to Neakok Pass and then Kasegaluk Pass. On the way, we saw a harbor porpoise, but no belugas at either place. We stopped at the barrier island at Kasegaluk Pass to rest, eat, beachcomb, and make sure there were no bears in the area. I was still hunting for amber and Jim Jim showed us an area called Amberville. We all found lots and lots of amber in the wrackline and in areas with sea tumbled coal. By 7:30pm, we packed up and headed north inside the lagoon towards Snow Goose Island. We stopped briefly at Neakok Cabin, an outpost for the community and a favorite place for picking salmon berries. 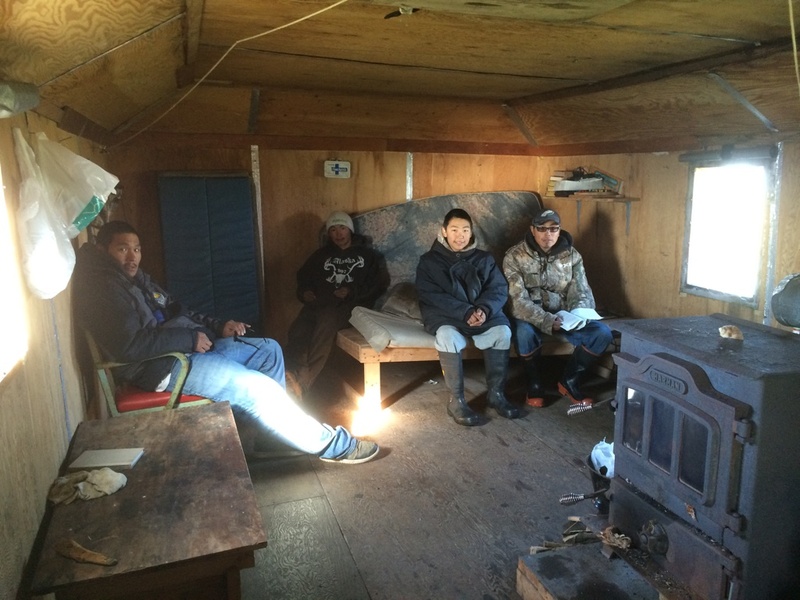 Robert, Cyrus, Gene, and Iqsi, surveyed the area for caribou to hunt and then we were off. As we approached the Snow Goose Island, the water became very shallow and we spent some time poling and lifting our engine while trying to locate the channel again. We eventually made it to our destination and gathered to discuss the plan to survey the island for snow goose nests. The mosquitos were really bad, so we had our head nets on and plenty of bug spray. The eleven of us spread out and spent and counted about 250 nests this year. 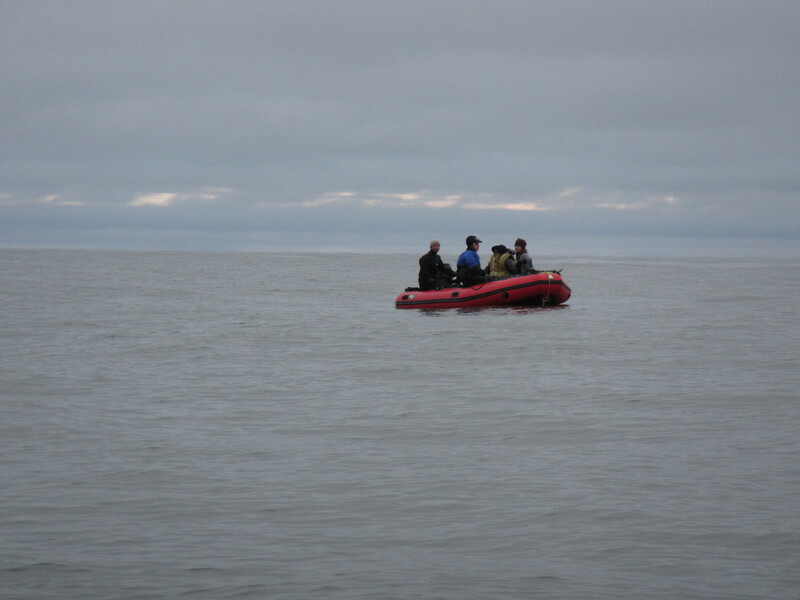 By 10:30pm we were done and back in our boats to look for beluga inside the lagoon and at the inlets. We got stuck again in the shallows but eventually made it to deeper water. Still no sign of beluga so Jim Jim and I shot off north checking out some of the bays and deeper areas for the next seven miles north. Back home and wiped out. Not feeling well. Probably dehydration. Drank lots and headed to bed. Inside Neakok Cabin. 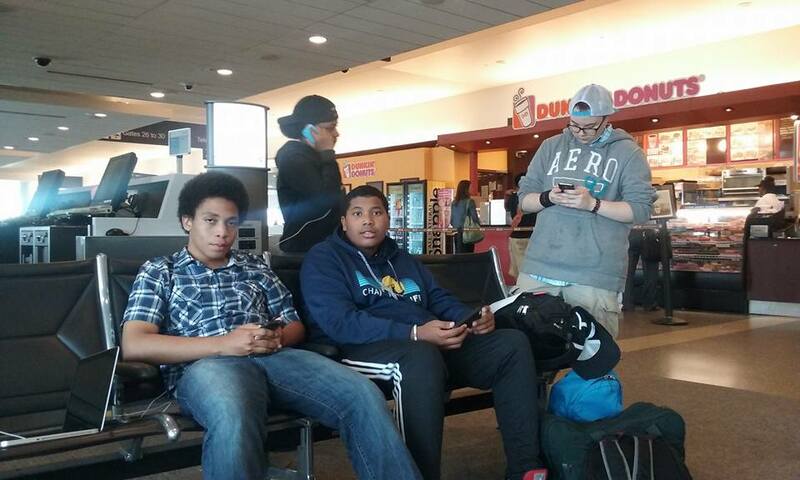 l-r: Cyrus, Genebyrd, Iqsi, and Robert. Searching Snowgoose Island and counting nests. 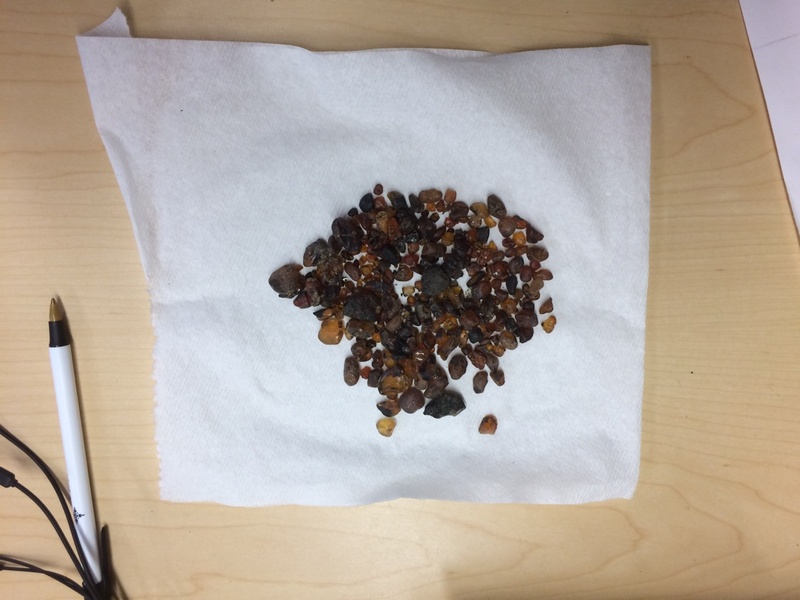 A decent amber stash from beach combing at Kasegaluk Pass and Amberville. July 4 – I woke up feeling much better and well rested. The most common greeting today: Happy 4th of July! Along with Bill Tracy, we all spent the latter part of the morning cutting lettuce, tomatoes, shucking and boiling corn, and boiling chicken in preparation for the day’s festivities. 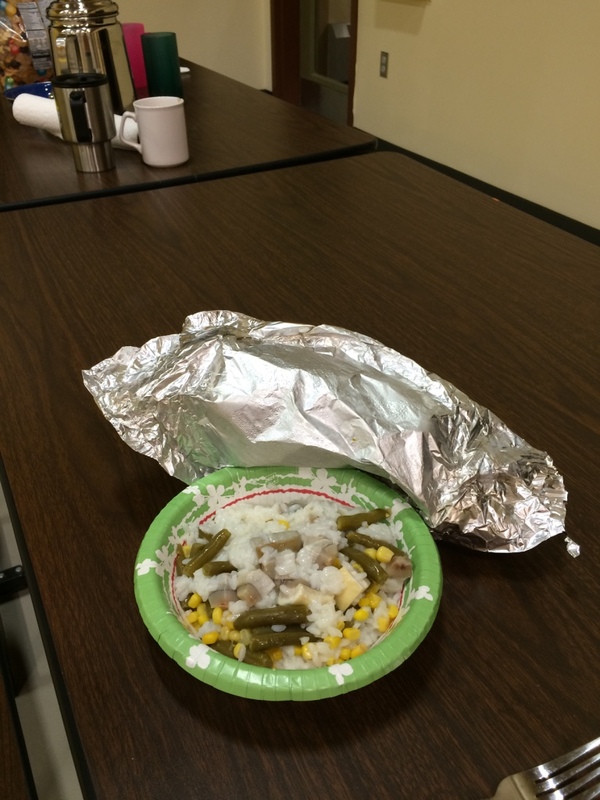 By the about noon, we had shifted to the community center, setting up and lighting grills. We would soon be cooking for about 250 people! Burgers, hotdogs, egg salad, pasta salad, fruits, fancy cakes, and more. In the midst of this, many of the games and races were under way. Various running races by age category were organized. I ran and won my category (challenging to do in knee high muck boots!). Donna and I were asked to be judges for the Eskimo donut contest, so got to sample seven different donuts. Once the grilling was done, the community gathered around the tables, everyone took their hats off, and one of the elders said a prayer. Then we feasted! After the food vanished, there was a short break and then Eskimo dancing began. We watched wonderful and varied dances that many of the Kali participated in either as drummers, dancers, or both. 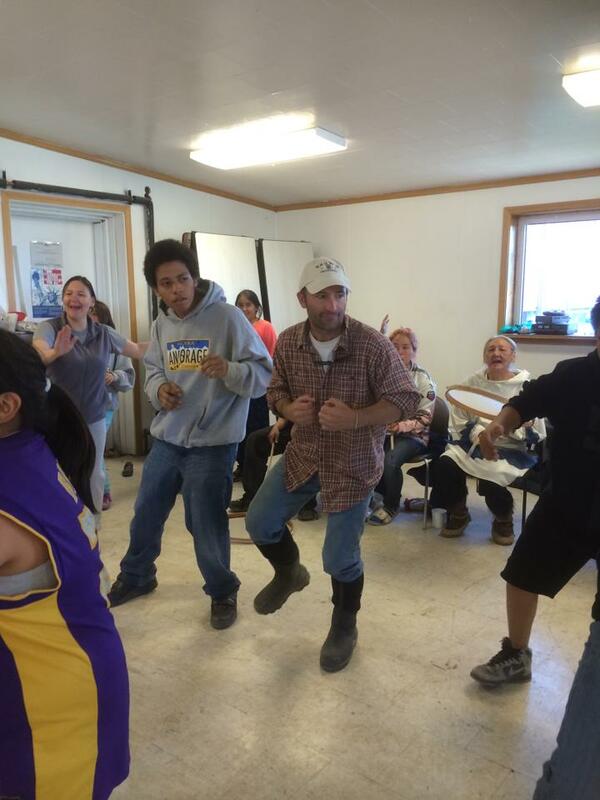 Near the end, the students, myself, Robert, Tracy, Donna, Greg, and Leslie and other guests joined in the dancing. 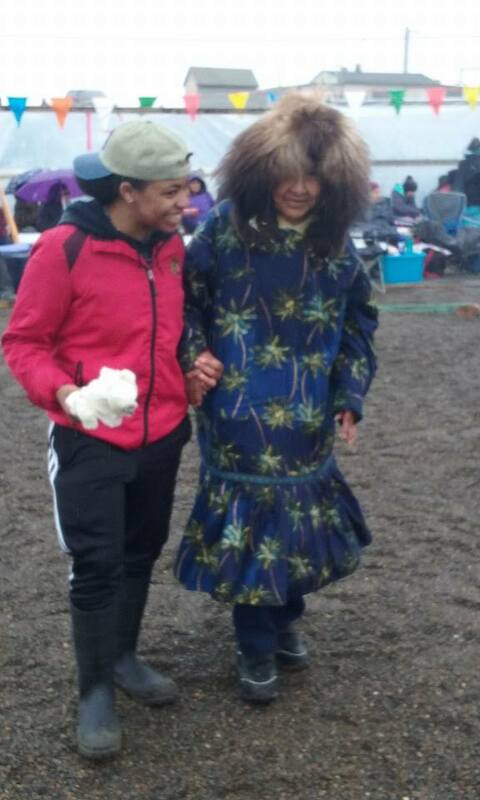 Then we taught the Kalimuit the round dance, something they all enjoyed doing. We helped clean up, then to the school. The students, Crissy, and I went to the shootout competition at the boat launch. The others stayed in and played farcle and to rest. We didn’t stay too long at the shootout and then headed back to the school. The movie tonight: Little Miss Sunshine. Nothing better for a good laugh. July 5 – Slept in till 11am. My time is more in line with Kali time now. Slow start to the day and around the breakfast table, beginning to discuss how the Cultural Exchange went this year and how we might add or change things to build in more structure to the program. Also that we need to start packing and cleaning for our departure tomorrow. Just as we began to settle in to the days plans, we got word that sisuaq (beluga) were spotted at Kali Sinogak (or Pass – I learned a new Inupiat word today). We all raced to get our gear together and down to the boat launch by about 2:30pm. It was about 75F and no wind in Point Lay today and REALLY bad mosquitos! Timm Ferreira and Jim Jim Tazruk joined us as we headed out through Kali and north towards 11 Mile Sinogak. I was in a zodiac with Timm, Jim Jim, and D’Vante and Jim Jim was anxious to get out so we were out in front looking for beluga. 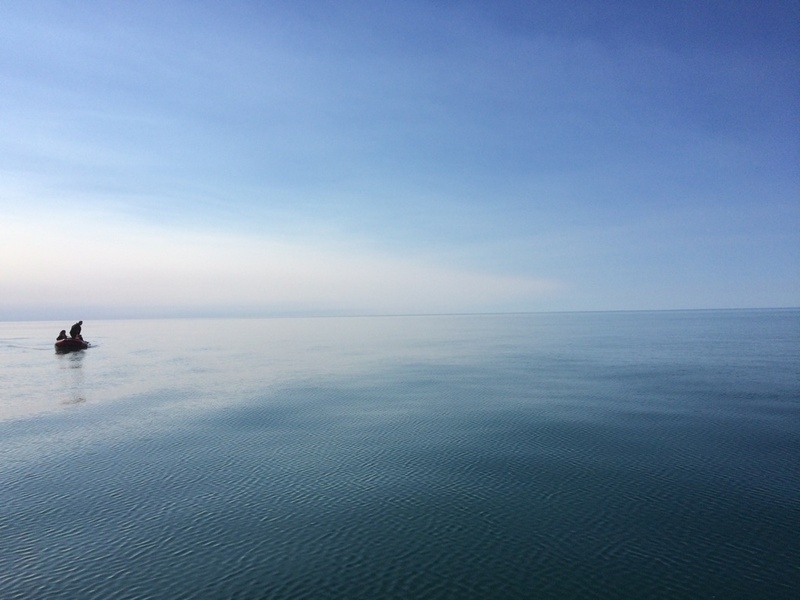 The ocean was really calm and we were a ways out. Saw some interesting linear currents off in the distance and Jim Jim said they were whale wakes. About 10 minutes later we spotted a gray whale and two bowhead whales (mother and calf). Lots of water fowl, but no beluga! Back at the school, we cooked, cleaned, and did some much needed laundry in preparation for our departure tomorrow. The students gave some gifts to their Kalimiut friends and we ended the night with a short film, Arctic Soundings: A Year in the Life of Bowhead Whale. Whale vertebra that Jim Jim put on the beach as a marker. 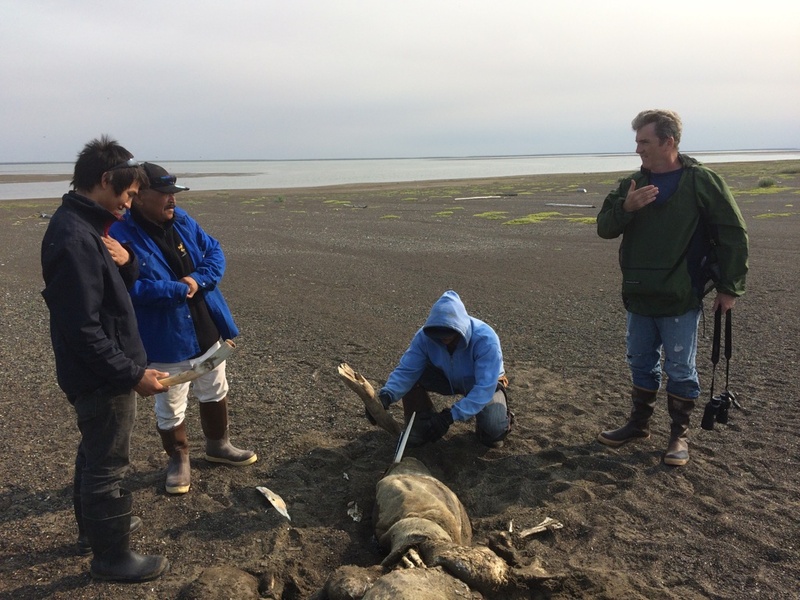 Taking turns extracting tusks, “eskimo money,” from a putrefied walrus. l-r: Timothy, Jim Jim, Patrick, and Greg. Following whale wakes on the Arctic’s Chukchi Sea. Dead walrus from last year’s stampede. 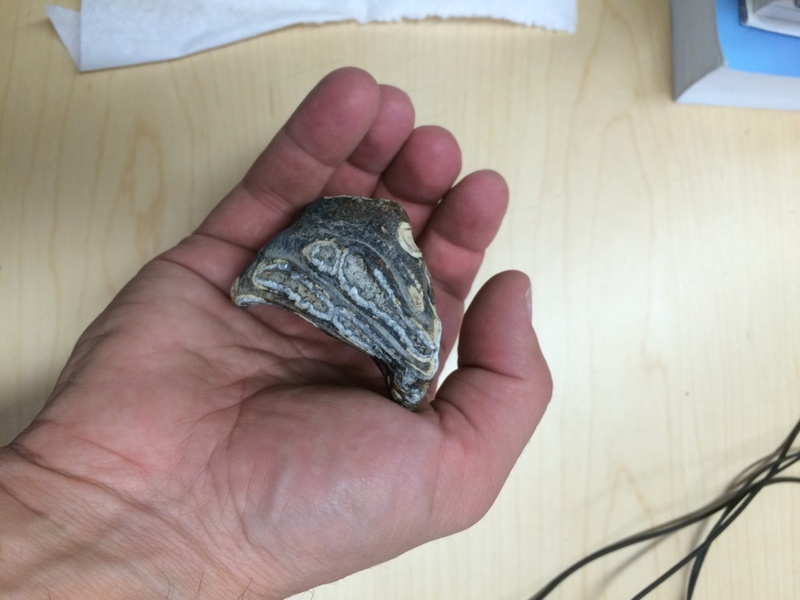 Mammoth tooth found by Jason on the beach. July 6 – Last day at Kali! 85F and very little wind! Lots of mosquitos! Slept in a bit, but up cleaning our space and packing for our return trip. I got on the village radio and announced that our “beluga dip” would be at the boat launch at 1pm. When we arrived there, we were the only ones and Crissy was mad at me that I was making her jump in. Marjorie Long wanted to do it as well. By 1:15 or so, there weren’t many people so we jumped in. Not too cold. 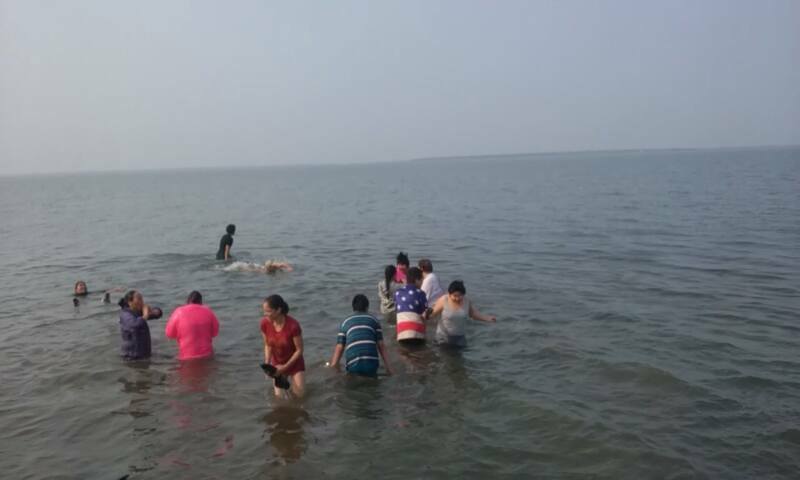 Once we did that lots more people fro the village came and joined us and we all stayed in the water!! It was a ton of fun! After the dip, we showered up and started loading our gear into Marie and Bill Tracey’s pickup. 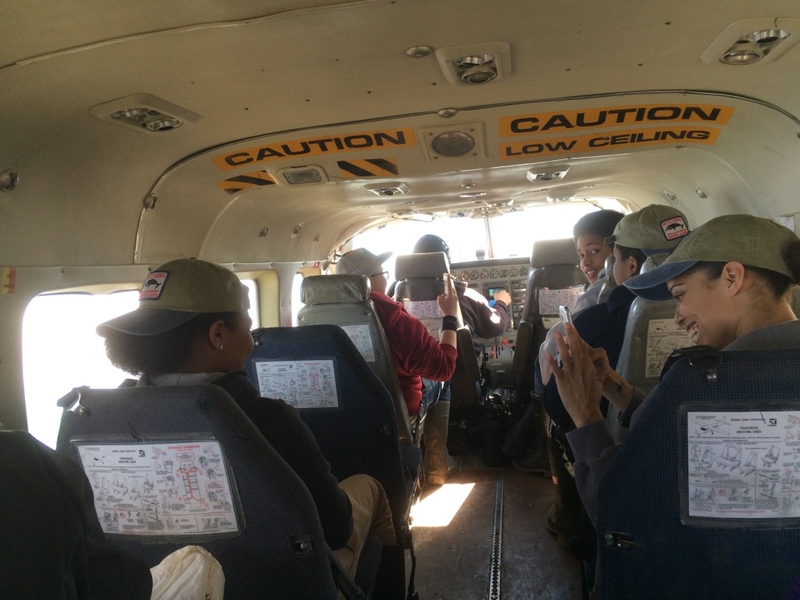 I visited a few friends and presented gifts and then back to the school for our ride to the airstrip. Good bye Point Lay and Kalimuit friends! Till next summer! Oh yeah! And more joined in after this! Kali airstrip and the hangar far in the background.